— Young Gun of Wine, June 2018. Brothers Matthew and Jonathan Hughes established Mewstone Vineyard in 2011 on the banks of Tasmania’s D’Entrecasteaux Channel in the tiny hamlet of Flowerpot. The small, boutique vineyard is a former cherry orchard and with some new plantings this year will expand to an ultimate size of just 3.5 hectares. The original plantings consist mostly of Pinot Noir with small plantings of Chardonnay, Syrah, Riesling and Sauvignon Blanc. Jonny studied winemaking at Lincoln University in New Zealand before gaining further experience in regions as diverse and far-flung as Langhorne Creek, Central Otago, Mornington Peninsula, Barolo, the Hunter Valley and the Okanagan Valley. Back in Tasmania, he was the Assistant Winemaker at Moorilla for seven years, before moving on to a similar role at Pooley Wines in 2016, where the Mewstone and Hughes & Hughes wines are currently made. 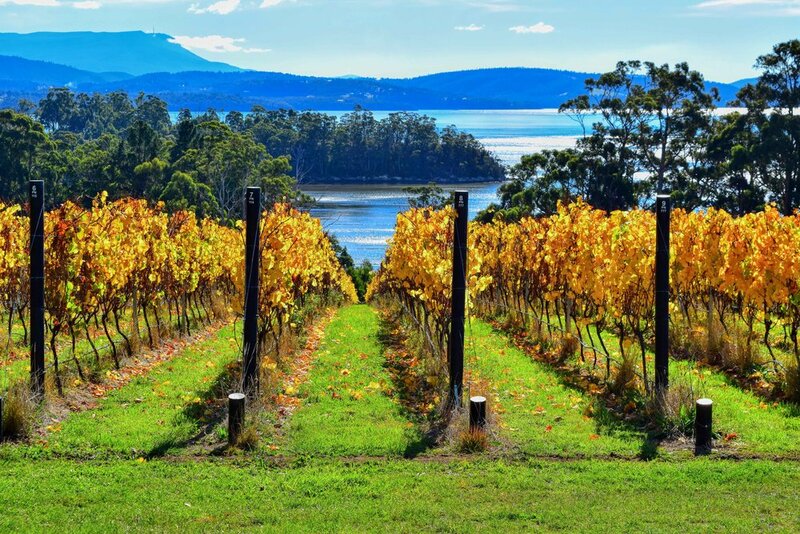 Whilst the Mewstone wines are strictly produced from the Flowerpot vineyard, the Hughes & Hughes range of wines brings together fruit sourced from around Tasmania, with the aim of producing wines that are high on both natural acidity and drinkability. In addition, from time to time individual small batches are released that capture the results of investigations into the use of skins, stalks, solids and other fermentation variables. All Hughes & Hughes wines are bottled unfined and with low sulphur. 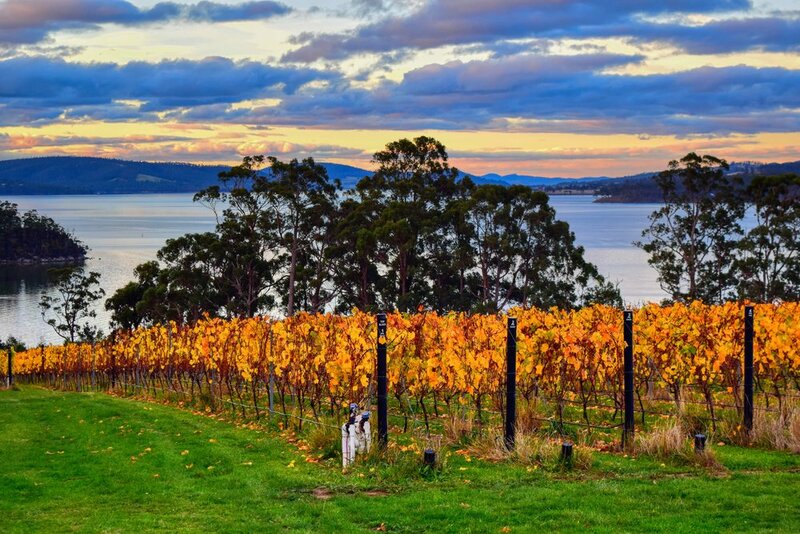 The Mewstone Vineyard lies on the banks of the D’Entrecasteaux Channel in the farmland of Flowerpot. The gently north facing slopes capture the cool southern sunshine, whilst the vineyard is protected from the harsh westerly winds by the hills that rise quickly from the water. The soils are predominantly duplex soils formed on Jurassic dolerite. This consists of loam textured topsoil over a sandy loam horizon on clay subsoil. The vineyard is hand pruned and the fruit hand picked. The extra effort put into ensuring a vibrant ecosystem below the ground translates into quality fruit on the vines above. Leading soil microbiologist, Letetia Ware, is a close neighbour and has guided the vineyard nutrition plan from the beginning. Through extensive use of mulches, composts and compost teas the soils are continually being revitalised. A comprehensive array of clones has been planted across the five varieties, both on phylloxera tolerant rootstocks and the vines' own roots. This diversity of selection brings complexity to the finished wines, but also provides an experimental lens through which to evaluate the optimum configurations for site and variety. 100% Riesling from the Mewstone vineyard, whole bunch pressed to old oak and naturally fermented for some 57 days. Matured on lees through to late spring before filtering and bottling. Only 1116 bottles produced. 100% Sauvignon Blanc from the Mewstone vineyard, whole bunch pressed to 50% new oak and naturally fermented. Matured on lees for six months and bottled at the end of spring. Only 564 bottles produced. 100% Chardonnay from the Mewstone vineyard, whole bunch pressed to 50% new oak and naturally fermented. Matured for nine months and bottled in late summer. Only 505 bottles produced. ﻿100% Pinot Noir from the two blocks at Mewstone, picked individually on the 11th and 12th of April. Each block was naturally fermented with 15% whole bunch in old milk vats and held on skins for 20 days. Matured in 40% new oak for nine months and bottled in late summer. Only 1920 bottles produced. 100% Syrah from the Mewstone vineyard, harvested on the 15th May. Naturally fermented with 8% whole bunch in an old milk vat and held on skins for 21 days. Matured in 40% new oak for nine months and bottled in late summer. Only 606 bottles produced. 100% Riesling from the Coal River Valley and the Derwent Valley, given 16 hours and 4 hours skin contact respectively, fermented in both stainless steel (95%) and French oak barrels (5%). Matured on lees for two months and bottled unfined. 100% Pinot Gris from Cooinda Vale in the Coal River Valley, given 24 hours of skin contact, extracting just a hint of colour and fermented in stainless steel. Matured on lees for two months and bottled unfined. 90% Merlot and 10% Pinot Noir from the Coal River Valley, the Merlot given 4 hours of skin contact, while the Pinot was drained off ferment after 48 hours. Barrel fermented in seasoned French oak barriques. Matured on lees for 2 months and bottled unfined. 100% Riesling from the Coal River Valley and the Derwent Valley, fermented in both stainless steel (95%) and French oak barrels (5%). Matured on lees for two months and bottled unfined with 7g/l residual sugar. 2508 bottles produced. 'From two districts, 209 dozen made, and like all the Mewstone wines, not fined. A flowery citrus and honeysuckle bouquet paves the way for a riesling of authority, resting easy on its laurels thanks to its inherent length and clarity of varietal expression. Drink to 2032.' 95 points, James Halliday, May 2018. 'I don’t have any details on this wine, other than that it’s from two Tasmanian regions. And that 2508 bottles were produced. It feels soft in the mouth and yet the intensity of flavour is excellent. Lime juice, steel, perhaps some lychee, spice too. Orange blossom. Deceptively complex; it creeps up on you. Super drinking. It lures you in and then keeps you entertained. Drink 2017-2025.' 93 points, Campbell Mattinson, Winefront, September 2017. 100% Riesling from the Coal River Valley, 100% barrel-fermented in French oak barriques. Matured on lees for two months and bottled unfined with 5g/l residual sugar. 1092 bottles produced. 'From the Coal River Valley, avant garde winemaking: fermented with solids in old oak and matured on lees. There is a nearly invisible touch of sweetness deliberately retained to provide the balance (and length) the wine has. 91 dozen made. Drink to 2032.' 94 points, James Halliday, August 2018. 'Fermented and aged in old oak. A touch of residual sugar. 1092 bottles produced, unfined. Soft, textural style offering excellent fruit intensity and an out-of-the-ordinary savouriness. Riesling with a difference, but in a balanced and nuanced way. Woodsmoke, lime, orange blossom and slate. Very good. Drink 2017-2023.' 92 points, Campbell Mattinson, Winefront, September 2017. 100% Sauvignon Blanc from the East Coast, Coal River Valley and D'Entrecasteaux Channel, fermented in both stainless steel (90%) and French oak barrels (10%). Bottled unfined. 4848 bottles produced. 'The mainstay sauvignon blanc in the Hughes & Hughes range. 4848 bottles produced. Straightforward sauvignon blanc with juicy, mouthwatering fruit surging through the palate. It’s a wine of cool sunlight and immense, fruit-washed drinkability. Mines a good zone. Drink 2017-2020.' 90 points, Campbell Mattinson, Winefront, September 2017. 100% Sauvignon Blanc from the East Coast, two-thirds barrel-fermented and one-third fermented on skins for three weeks then pressed to seasoned oak. The barrel-ferment component went through malolactic conversion. Bottled unfined. 1188 bottles produced. 'Sauvignon blanc with the box, dice, and everything else thrown at it – in a measured way. Some of it also goes through Malo. 1188 bottles produced. Straw-coloured. An anti-hero version of the sauvignon blanc grape. Everything is toned down and steely, like Tarzan in a business suit. It tastes of gunmetal and snow peas, spice and cedar wood, smoke and a haze of tropical fruit, grapefruit too. It feels dry and sophisticated. It does because it is. It’s a play at style; the score is irrelevant. Drink 2017-2020.' 90 points, Campbell Mattinson, Winefront, September 2017. 100% Pinot Gris from the Huon Valley, fermented on skins for three weeks then pressed to seasoned oak. Matured on lees for two months, the wine went through malolactic conversion and was bottled unfined. 828 bottles produced. 'From an organic vineyard in the Huon Valley, crushed, destemmed, and wild-fermented on skins for 21 days, matured in oak for 2 months while undergoing mlf, 69 dozen made. Full copper-pink; a very dry pinot gris, and - despite no fining - positively delicate on the finish, remarkable given its vinification. A cross-dresser with roses made in similar fashion.. Drink to 2022.' 93 points, James Halliday, August 2018. 'Pinot gris from the Huon Valley. 21 days on skins, then pressed to oak for ageing on lees. 828 bottles produced. Copper-orange coloured. Perfumed and lively but dry and grippy. It draws you in and then puts you on the rack. Turkish delight, apple skins, pears and spice. Florals aplenty. A kind of yeasty cedar wood character. Plenty going on, in flavour, aroma and textural terms. Needs the right food, and the right bar. Drink 2017-2018.' 90 points, Campbell Mattinson, Winefront, September 2017. 100% Chardonnay from the Derwent Valley and the Huon Valley, 100% barrel-fermented in a combination of new and seasoned French oak barriques. Matured on lees for four months, the wine went through malolactic conversion and was bottled unfined. 2496 bottles produced. 'From the Derwent and Huon Valleys, it is 100% barrel fermented in new and used oak, matured for 4 months on lees. The aromas and flavours are in the grapefruit/citrus corner of the ring, minerally in tandem. Drink to 2027.' 95 points, James Halliday, May 2018. 'Chardonnay from Tasmania’s Derwent and Huon valleys. It went through full MLF but it’s racy with acidity, crunchy indeed, the fruit flavours themselves having taken on a creamy softness but the structure left intact. This is another glittering release under the Hughes & Hughes banner. Smoked bran, rosewater, lemon, fresh cedarwood and stronefruit; it’s exotic and subtle at once. This will improve with some bottle age. Drink 2018-2024.' 93+ points, Campbell Mattinson, Winefront, November 2017. 100% Pinot Noir from the Huon Valley, D'Entrecasteaux Channel, Coal River Valley and Derwent Valley, each batch fermented separately and held on skins for 18-22 days. Matured on lees for four months and bottled unfined. 6540 bottles produced. 'From the D'Entrecasteaux Channel and the Coal River, Derwent and Huon Valleys, each batch individually fermented and held on skins for 18-22 days, a 9% whole bunch carbonic ferment blended in, matured in oak for 4 months, like its siblings, not fined. Light, bright clear crimson; the most attractive, fresh, relatively light-bodied pinot, left to express itself without forcing, purity its essence. The palate is filled with red and purple fruits, and given texture by superfine, savoury tannins. Drink to 2027.' 94 points, James Halliday, August 2018. 'Grapes from "the D’Entrecasteaux Channel and the Coal River, Derwent and Huon Valleys. Each batch was individually fermented with R71 yeast. Each batch was held on skins for 18-22 days before being pressed to oak. In total it has 9% whole bunch." These Hughes & Hughes wines are always super interesting. Here’s another. It’s fresh, it’s spicy, it leaps from the glass, it has depth. Cherry bubble gum, darker fruit notes, chicory spice, woodsmoke and an array of soils and herbs. Twiggy but in a fruit-filled, lively context. Creamy/musky oak makes a play but not a concerted one. We’re in beautiful pinot noir drinking territory here. Drink 2017-2024.' 93 points, Campbell Mattinson, Winefront, November 2017. 91% Pinot Noir, 5% Chardonnay, 4% Pinot Gris from the D'Entrecasteaux Channel. Two batches were co-fermented with the Pinot Noir, one with the Chardonnay and the other with the Pinot Gris, each held on skins for 21 days. Matured on lees for four months and bottled unfined. 1188 bottles produced. 'From the D'Entrecasteaux Channel. The colour has a little more purple than its 15% Whole Bunch sibling, probably ex the co-ferment components of the blend, one with 5% chardonnay, the other 4% pinot gris. It has a profoundly complex bouquet, with spices woven through dark cherry and plum fruit, the palate seamlessly incorporating the lead of the bouquet, but building and expanding the baroque splendour of a very, very good pinot noir. Drink to 2032.' 96 points, James Halliday, May 2018. 100% Pinot Noir from the Derwent Valley. Fermented in four puncheons, two open and two closed, each held on skins for 21 days, with only the open puncheons lightly plunged twice. Matured on lees for four months and bottled unfined. 1188 bottles produced. 'From the Derwent Valley. The avant garde winemaking is an unqualified success: barrel-fermented with 15% whole bunches, left strictly alone with no plunging (nigh-on impossible in any event) or pumpovers. Elegance is the key descriptor of a wine with potent pinot berry and plum fruit within a garland of savoury notes coupled with very good tannins. Drink to 2029.' 95 points, James Halliday, August 2018. 'Pinot noir from the Derwent Valley. 1188 bottles. It drinks well now but it will soar given cellar-time. It combines tension and stuffing in just the right way. Sweet, sour, spiced and smoky; red cherries and plums with emphasis on the cherries; it looks light but it’s not; the finish keeps on going when it has every right to pull up stumps. It’s a long, lean pinot noir with a sleeve stuffed with tricks. Excellent pinot noir. Drink 2019-2025+.' 94 points, Campbell Mattinson, Winefront, November 2017. 'Medium to light yellow colour with a tint of grey, the bouquet is oak-kissed as if it's been barrel fermented. There's a note of talcum powder, too. The wine is rich and full, soft and texturally unusual but appealing. The palate is quite rich and full for a young riesling, finishing with a touch of bitterness - presumably from skin contact. A good wine but a slightly eccentric style of Australian riesling. The muscaty cool-climate riesling fragrance came up beautifully with extended airing. A fascinating wine. Drink 2017-2029. (930 bottles made).' 95 points, Huon Hooke, The Real Review, September 2017. 'Hand-picked, whole-bunch pressed direct to French oak for wild fermentation and ageing on lees, 96 dozen made. Here new French oak and a rich, supple, yet intense palate with white peach and nectarine all sing in perfect harmony from the same page. The lingering aftertaste reaffirms everything you have encountered on the bouquet and palate. Drink by 2026.' 95 points, James Halliday, July 2018. 'I have a bee in my bonnet about the oft-used term “Tasmanian acidity”. It’s not a phrase I like to see; it looks lazy to me. And so I’m a little red-faced to admit that when I first tasted this Chardonnay from Mewstone, the first thing to pop to mind was indeed that phrase. It’s a wine with flavour, texture and length but yes, it’s slipped with cool-light acidity. It gives the wine a certain ring of confidence. There are notes of ginger, preserved lemon, pink grapefruit and oyster shells here, and while I’m sure there was oak involved there’s very little sign of it in the wine. A kiss of toasted cedar wood, is all. More than anything it’s about pure fruit, illuminated by a cool low light. Thankfully it went through malo; it needed to. Pick this up in three years (+) time and it will be just starting to hit its straps. Tasmania certainly knows how to produce modern wine stars. Drink 2019-2025.' 94 points, Campbell Mattinson, Winefront, July 2017. 'Very deep red/purple, bright and youthful. Superb black cherry aromas of very ripe pinot noir, and full of interest - not simple. It smells luscious. Gorgeous sweet-fruit pinot flavour and soft, ample tannins providing a foil for the delicious ripe fruit. Excellent pinot. Drink 2017-2031.' 96 points, Huon Hooke, The Real Review, July 2017. 'We are on to a very good thing here. Rejoice. Make hay. Get in. This wine nails the centre point between sweet fruit and outright savouriness, and for good measure adds undergrowth and forest berry flavours aplenty. It’s plush and direct at once; it uses oak to modest but important effect; it’s awash with fruit but long and mouthwatering. There’s even a linger of smoke and/or mineral to the aftertaste. It is, in short, a beautiful wine. Drink 2017-2024.' 95 points, Campbell Mattinson, Winefront, July 2017. 'Shiraz/syrah grown in an incredibly southern situation. Indeed it would be difficult to find a more southern destination for Syrah. Beautiful shiraz. Painted in watercolours. Spice, leaves, peppers, nuts and florals. Tangy, spice-infused cherries rise as the wine breathes. Not in any way heavy. Well ripened. Intricately tannic. Has a dusty, twiggy character to the aftertaste; in a positive sense. Could probably – just – do with a bit more oomph but we’re in delicious cool-climate territory here. Drink 2017-2023.' 92 points, Campbell Mattinson, Winefront, July 2017.